Our RS-232 optical isolators are ideally suited for many applications – from “control panel” installations requiring DIN Rail mounting to “in-line” or “bump in the cable” installations found in laboratory or retail systems. They provide 2 kV of isolation to protect your equipment as well as a variety of connector options. If you require extended temperature ranges and extra rugged construction, our industrial products will fit the bill. They have advanced EMC and emissions specifications that run the gamut from light industrial EN 61000-6-1 to heavy industrial EN 61000-6-2 with IEEE 1613. We also offer versions with UL 508 and UL Class 1 Division 2. The 232OPDR is a DIN Rail mountable RS-232 optical isolator and repeater. 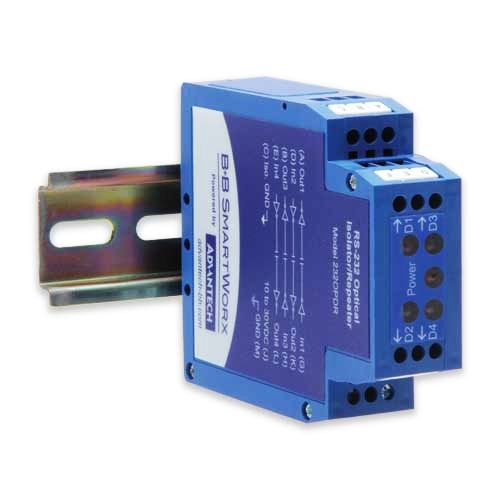 It provides 2000 V Isolation for four RS-232 signal lines, two in each direction. The isolator has four LEDs to show data flow and one LED to indicate power. Connections are made to a terminal block. The isolation provides protection for computer equipment from ground loops and induced currents caused by lightning or heavy electrical loads. It also functions as a repeater to extend RS-232 signals another 50 feet. The 232OPDR can support two data pairs or one data pair plus control signals in both directions. The 232OPDRI is our premium Industrial RS-232 Isolated Repeater. Designed for rugged industrial environments, it is UL listed and certified for use in Class 1 Division 2 locations. Powerful Optical Isolation on both data ports protects your equipment and data from damaging ground loops and surges. Additional isolation on the power supply circuits adds a third degree of protection. The 232OPDRI-PH is our premium Heavy Industrial RS-232 Isolated Repeater. Designed for rugged industrial environments, it has been put through some of the most exacting compliance tests in the industry. Meeting the requirements of IEC 61850-3 and IEEE 1613, it is suitable for installation in electrical substations. These specifications are more stringent than the NEMA TS1/TS2 requirements for transportation applications. Powerful isolation on both data ports protects your equipment and data from damaging ground loops and surges. Additional isolation on the power supply circuits adds a third degree of protection. the DTE side and a DB25P male connector on the DCE side of the isolator. The Model 232SPHI4 isolates and protects RS-232 equipment from lightning surges, accidental high voltage shorts, and ground loops with 4,000V isolation – twice the rating of most isolators. Supports RS-232 data signals up to 115.2K bps as well as the RTS and CTS handshake lines. The 9POP4 isolates and protects RS-232 equipment from lightning surges, accidental high voltage shorts, and ground loops. RS-232 data signals TD, RD, RTS, and CTS are supported at up to 230.4 kbps. The Isolation Circuits are rated to 2.5 kV and protect your valuable equipment while maintaining maximum uptime. Model 9SPOP2 optically isolates both the RS-232 transmit and receive lines. The isolator has a DB9S female connector on the DTE side and a DB9P male connector on the DCE side. Signals pass through the isolator as shown below.